In this beginner glutes workout, learn how to start working the largest and strongest muscle in your body. Your gluteal muscles – also known as glutes – help you walk, run, climb and keep your balance. The hours-long pressure put on your backside each day, whether sitting at the office, in the car or in front of the TV, can cause those gluteal muscles to wither and sag. John Prater, a Gold’s Gym fitness coach, created a three-part workout series that is all about strengthening your glutes, starting with squats for beginners. First, here’s what you should know about the three main gluteal muscles. The gluteus maximus is your body’s biggest and most powerful muscle. “It’s responsible for, among other things, keeping your trunk in an erect posture,” Prater says. The gluteus medius, near your waist, helps you walk with a steady gait. The gluteus minimus, the smallest of the three glutes, helps you extend your hips and raise your legs to the side. Start with 10 minutes of slow cardio: Take a light jog or walk on the treadmill, or try the elliptical machine, bike or rowing machine. Follow that with five minutes of moderate stretching. After that, perform three sets of 15 reps on the hamstring curl machine. If you need help finding this resistance machine, ask a Gold’s Gym staff member. (For more on the basics of resistance machines, see our guide.) Start with a minimum amount of weight that allows for a full range of motion. Then, choose a weight that’s challenging but doesn’t cause too much strain. Lie down on your stomach on the bench and hook your ankles in place behind the padded leg rests. Draw your ankles toward your buttocks until your legs form a 90-degree angle. Slowly return to the starting position. After the cardio, stretching and the hamstring curls, continue with the squats for beginners below. 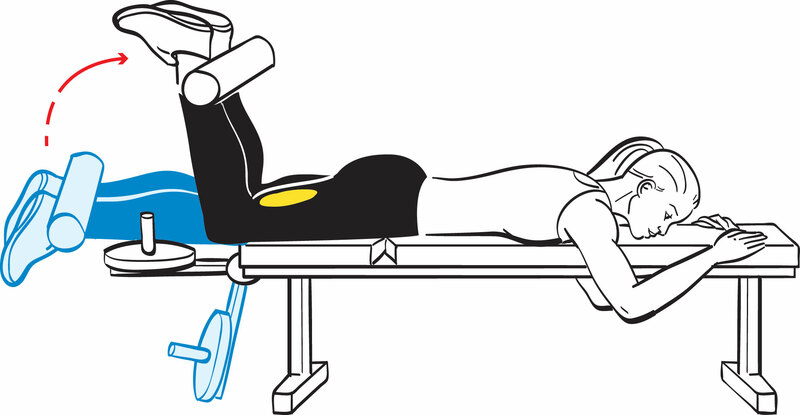 The first exercise uses the simple machine known as the glute isolator. It’s great for beginners because it provides the stabilization necessary to do more strenuous movements. Again, ask a Gold’s Gym staff member if you need assistance locating one of the machines. Once you’re at the machine, rest your chest on the pad in front of you. Place one foot against the pedal behind you. Push back with your leg, and then slowly return to the starting position. After completing one set, switch sides. The goal: Perform three sets of 15 reps on each leg. Stand with the dumbbell at your feet. Squat and grab it with both hands. Rise, and then return to the squat, and touch the dumbbell to the floor. Complete one set and hold the squat for 30 seconds. Start with a dumbbell at a minimum weight that allows for a full of range of motion. Then, choose a weight that’s challenging but supports a smooth and strong movement. The goal: Perform three sets of 10 reps.
Start in a squat position with your feet shoulder-width apart and your arms extended parallel to the floor. Swinging your arms down and back, jump as high as you can and come down with your knees bent. Jump again with no rest. For the last exercise in our squats for beginners workout, begin in a standing position with feet apart. Squat and place your palms on the floor in front of you. Kick your feet back as if you were going to do a push-up. Quickly return to the squat position and then stand up. The goal: Perform three sets of 15 reps.
Trainer tip: This classic gym exercise incorporates aerobic training and resistance training into one sequence to really give your cardiovascular system, legs and upper body a thorough workout. It also helps you improve your coordination.